Step into the world of circus manager Roxana Icu as she works frantically backstage to ensure the kids are kept entertained. Recorded in immersive stereo, best heard on headphones. Step into the world of circus manager Roxana Icu as she works frantically backstage to ensure the kids are kept entertained out front. Episode three of a new series of immersive features which allow the listener to step into the world of a compelling character with an extraordinary job. Recorded in binaural stereo using the latest recording techniques for a rich, lifelike and intimate sound. Subjects wear a small microphone in each ear, picking up sound just like the human ear. Whatever they hear, we hear - how they hear it. The series is best heard on headphones. 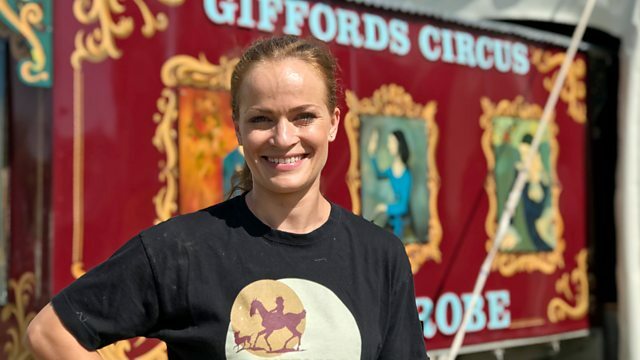 In this episode, we're backstage with the company manager of Giffords Circus as she pulls out all the stops to ensure that everything goes to plan out front. Highly skilled circus artists performing dangerous acts must be kept happy, the ponies and sausage dogs must make their entrances on cue - and wardrobe malfunctions remain an ever present danger.